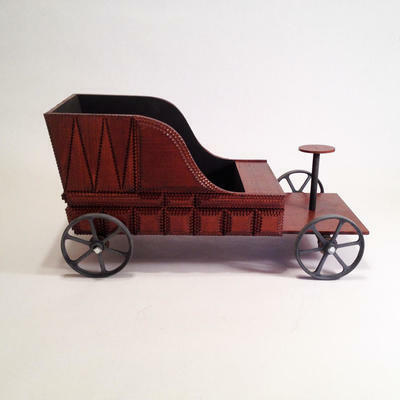 This pieces was inspired by several 1800's wicker toy cars I have seen with Santa as the driver. It is the perfect vehicle to display your collection of antique or new Christmas items…..ornaments, bottle brush trees, Belsnickles, Santa figures, etc. OR use it for any holiday with your favorite items displayed in the back. This German style automobile is handmade and layers of Tramp Art are applied. The finish is a custom mixed stain and the interior is painted with a deep brown/black. The wheels are hand-cast lead that have been acid washed to get the correct amount of age/patina. If you are interested, I can take orders for this piece at the size shown or the smaller size of 6"W x 12.75"L x 6.5"H (Small). Please contact me for more information, pricing or questions.